With 46mm of rain & a wind warning forecasted for the day, five intrepid Alpine Club of Canada members headed out for a hike on the Kludahk Trail. It felt pretty much like we were in a shower all day long. A very cold shower. Gaiters over rain pants, Vancouver Island special. I didn’t really mind so much, as there was SNOW! A very small amount, but still … it was very exciting to see snow just 90 minutes outside of Victoria. The Kludahk Trail runs along the San Juan Ridge on the west coast of Vancouver Island. It’s mostly parallel to the Juan de Fuca marine trail, but it has an alpine feel because of the elevation (around 1000m). One of many interpretative signs in the Tea Hut. Another thing that makes this trail special is that it’s dotted with huts that are meticulously maintained by the Kludahk Outdoor Club. We parked one of our cars near one Blueberry and one near Tower. We hiked to Blueberry and were warmly welcomed by the people who were there for the weekend, enjoying some sizzling bacon and staying warm by the wood stove. Despite being invited in, we stayed outside so we didn’t get their stuff wet. Then off we went to the Tea Hut, which was a small shelter full of interpretive signs about the animals, plants and geology of the area. Oh yes … and tea! We boiled some water on the propane burner and had some gourmet, loose leaf tea. I pulled out my sushi that I brought for lunch and felt happy about having such a fancy lunch in the middle of nowhere. I signed the log book & cleaned up and then we left for our last stop, Tower Hut. Before we could get very far, we came across rather fresh animal tracks heading the same direction we were. There was some debate over what they were, but later at home I was able to identify them as most likely being cougar tracks. No sign of the cougar though… thankfully. The snowy meadow was beautiful. But it was hard to stop and take photos due to just how wet it was. Before I knew it, we were Tower. We popped in for a little look around and to warm up. Two story cabin! I saw some photos of the snow going all the way up to the second floor. We left some cash in the donation box for the tea & propane we had used. We also learned why there was a “Mouse Tally” on the wall, as one of us emptied some used traps. After our third stop, I was feeling pretty wet and cold. The rain had soaked through my waterproof pants, gortex shoes and my waterproof pack — leaving most of my body & equipment soaked. We did a zippy bushwhack back to the car where my dry clothes were waiting for me. I am looking forward to hopefully being able to join the KOC next summer & helping to contribute to the maintenance of the trails and cabins. 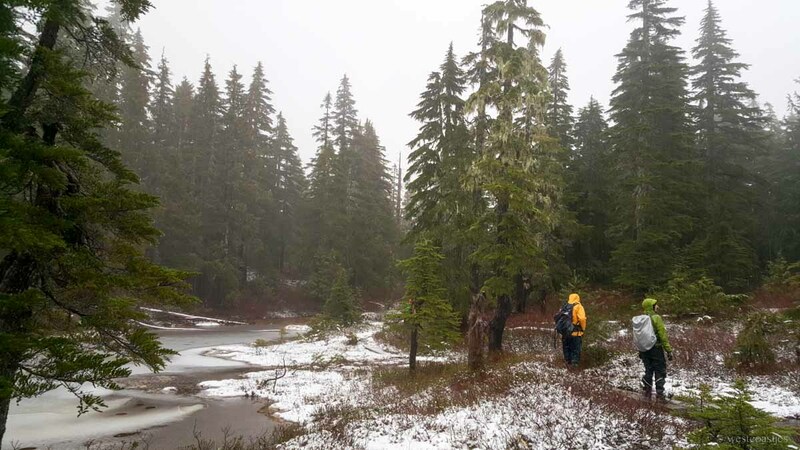 Thanks for the information on your blog – I hope to do this soon…maybe in snowshoes once the lower elevations receive some.